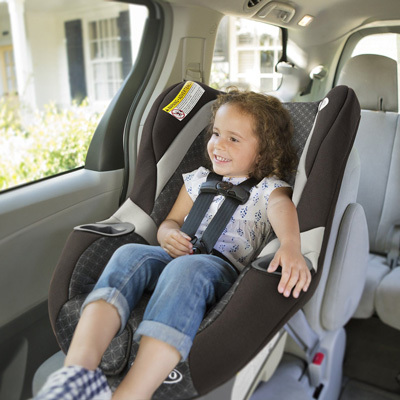 When parents make their decisions to buy one car seat over another, there can be an enormous amount of anxiety that takes place. Everyone wants to feel that they have done their very best for their child in terms of keeping them safe while riding in the family vehicles. But there are many designs sold from many manufacturers, complicating the decision making process. The price, safety features, appropriate size, ease of use, weight when transferring from place to place and the longevity of use all are important factors. With a convertible seat being one of the highest budget items a new family must afford, it can be difficult to decide how best to spend those funds. Most parents are looking for safety features above fashion. Though they may enjoy indulging their children with happy colors and patterns, those things ultimately take a second place to that all important level of protection required. The following reviews take a brief look at the basics offered with each seat design and highlights from comments made by parents who own them. 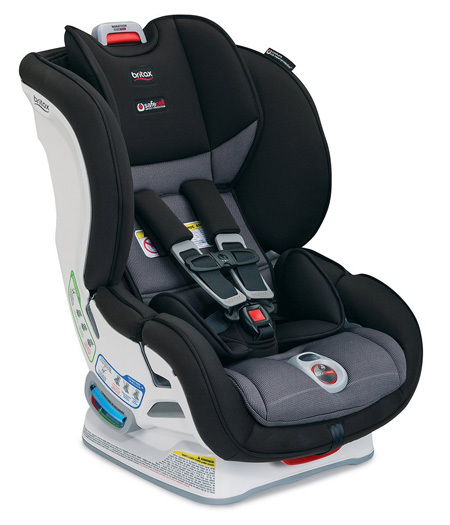 The amazing ClickTight features that distinguish the Britax brand are also present in this model car seat. 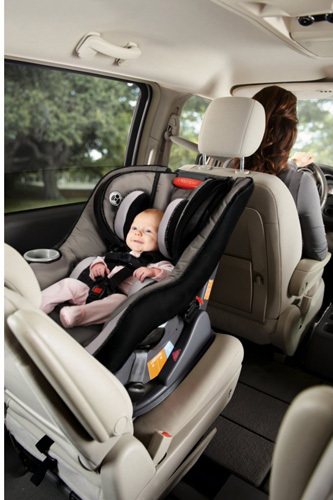 The safety tests and attention to surrounding the child with protective measures such as its reinforced steel frame and proprietary padding help to keep the occupant secure while traveling. The harness and installation systems are designed to fit into the car with a simple click. This U.S.A. made product will accept children weighing five pounds up to sixty-five pounds. 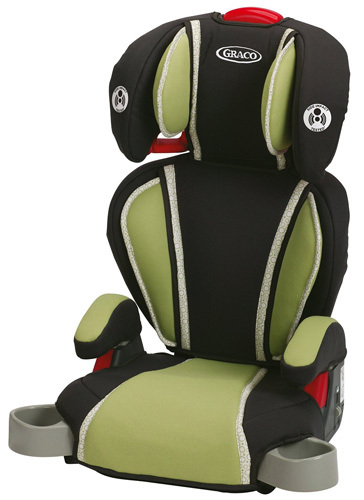 The seat can be placed rear or forward facing as the child grows up. Parents who own this seat consider it outstanding and are well prepared to pay the extra price to have that extra measure of security they feel it brings. 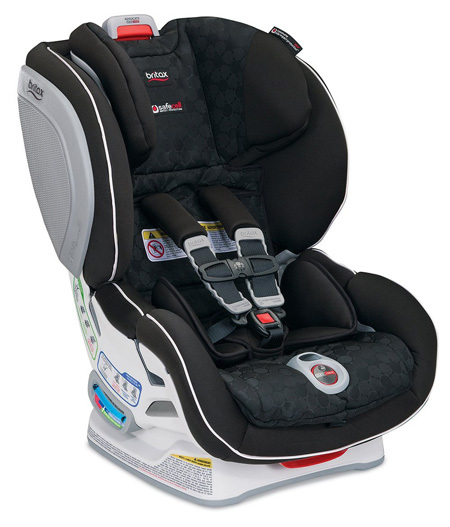 This imported seat features black upholstery with a grey patterned inset design cover. It can be used for both rear and front facing positions. The cover is machine washable. The seat is hand washable with a mild soap. Only the harness and buckle must be wiped clean using a damp cloth. It will accommodate a child weighing five pounds up to sixty-five pounds. The product is free of Lead, Latex, BPA and Phthalate.The majority of parents who own this product truly like it. The only problem mentioned is that the seat is very large, and some with smaller cars discovered that it barely fits the way it should. This model is designed for children who weigh anywhere from 20 to 57 pounds and 27 to 57 inches tall. The product has been crash and safety engineered and tested, featuring steel reinforcements as part of its construction. The seat is made from a comfortable foam material that absorbs energy for greater impact safety. There is a headrest that adjusts for comfort. People owning this item like its grey seat, but dislike the black arm rests, which cause pain when they become hot. They like the relatively light 21 pound weight, because it is easier to handle than other heavier brands. Some feel that it is not suitable for children who grow more rapidly than the standard for their age bracket. The crotch strap is too small and tight for many. Some find that it doesn’t recline to a comfortable position. Overall, most are very satisfied with their purchase of this car seat. This model car seat is also one of the most expensive available. But, parents who own this brand are very devoted to its safety features. They cite the superior engineering included to protect children and they wouldn’t trade it for anything else. The company has trade names for its safety features. There are three key elements in each seat. These include their SafeCell Complete Side Impact Protection feature, the ClickTight feature that allows for perfect installation each time and the overall SafeCell provisions for completely enclosing each child within a steel frame construction that exceeds industry standards for impact protection. This toddler focused seat is designed to accommodate those ready to sit facing forward. It will accept weights from twenty to sixty-five pounds. It has a comfortable harness system that easily adjusts using one hand. It will automatically adjust to a new height, making it easier for parents to use it and know that it is properly secured. The latch will secure in one second, and there is an easy to see red button to disengage the latch quickly. There is one cup holder molded into the right side armrest. The seat’s pad is machine washable. Most parents mentioned the high quality side impact protection as a plus. This extremely well made seat is one of the more expensive available. It’s manufactured for ultimate safety. There are protective side guards and one of the most sensible systems for locking the seat securely and properly into the car. 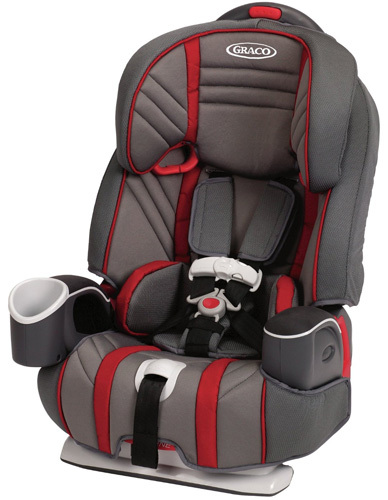 There are multiple levels for reclining and multiple harness points to accommodate a wide variety of needs. The parents who own this highly recommend it and admire the brand for its commitment to quality. Most would not consider buying another brand, regardless of the cost. They believe the safety level is so high that the cost is well worth it. This adorable themed car seat has all the style for a child to enjoy. 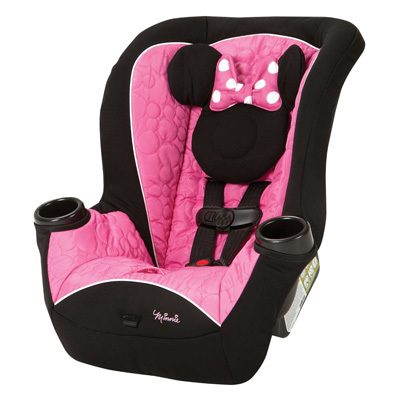 Its headrest features mouse ears and a pink bow with white polka dots. What could be more Minnie than that? It is designed for a youngest infants from four pounds up to forty. It adjusts from rear facing to front as the little one grows. There are two cup holders in the armrests for easy access to bottles or sippy cups. Parents who own this truly have fun with the Mouseketeer theme and enjoy pleasing their children with it, too. The only customer reviews that were negative were concerning how quickly older children may grow out of the seat range, making the investment a short-lived one. This seat is made completely of polyester. In addition to the gray and black Saturn model, there are the turquoise and Neptune, the darker Pink Mums and the light pink Ella. Each of these patterns is paired with black. Manufactured in the United States, containing local and global materials, the product has met and exceeded federal safety testing standards. It has a washable pad and head rest that are both removable. Those who own this seat like its price and lighter weight. Some have had problems with it not fitting well when used in the rear facing position. Owners of several different car brands made this comment in reviews. One parent noted that the airline insisted that the seat be checked as baggage because it was not stamped as FFA approved, leaving their child without it on the plane ride. 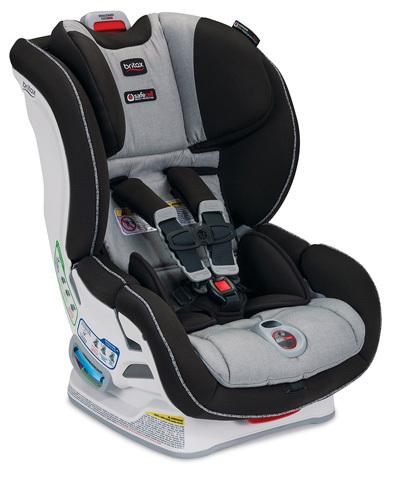 Graco has responded to the need for a taller car seat for children who are bigger than average. The company has designed this product to help parents whose children are in the higher percentiles for height or weight. This wish list model features green padding panels to protect sensitive skin and has been crash tested and rated as top quality by major magazines and publications. Parents who own it like its light weight, and its booster seat function. They are very specific that it should not be considered a safety chair. The manufacturer lists its two adjustments clearly. It has “Highback” and “Backless” positions which are adjustable for weights from thirty up to one hundred pounds, and heights from thirty-eight to fifty-seven inches tall. It includes storage and cup spaces on either side of the seat.There are four color and pattern options in addition to the Go Green. They include Spitfire, Rock Out, Mosaic and Ladessa. All are combinations of black, green and blue except for Ladessa, which is primarily hot pink. 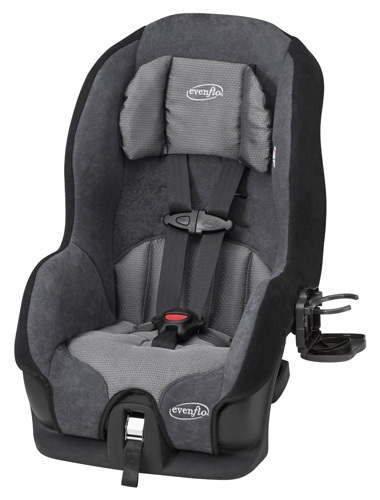 An Amazon Number 1 Best Seller based on 3,322 customer reviews, this convertible safety seat for children offers a range of use based on twenty to one hundred pounds. Children in the different weight range regulations will have several riding options. There is a harness with five points for babies who whose weight is at least 20 pounds. The next weight minimum of 30 pounds is covered with the positioning booster and high back belt adjustment. The minimum 40 pounds weight category uses the booster, converted to backless. The frame is reinforced with steel for safety and durability. 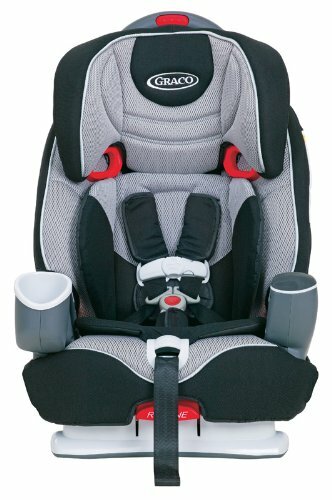 Described as “multi-mode” the various configurations are designed to safely accommodate children who are ages one through ten, and who are within the weight limits described. There is also a height range limit from 27 to 57 inches. There is a reclining feature with three levels, and a cup holder.